In the decades since Beech Mountain hosted twin VW Beetles, its roster of snow sports has grown to include snowboarding and tubing. 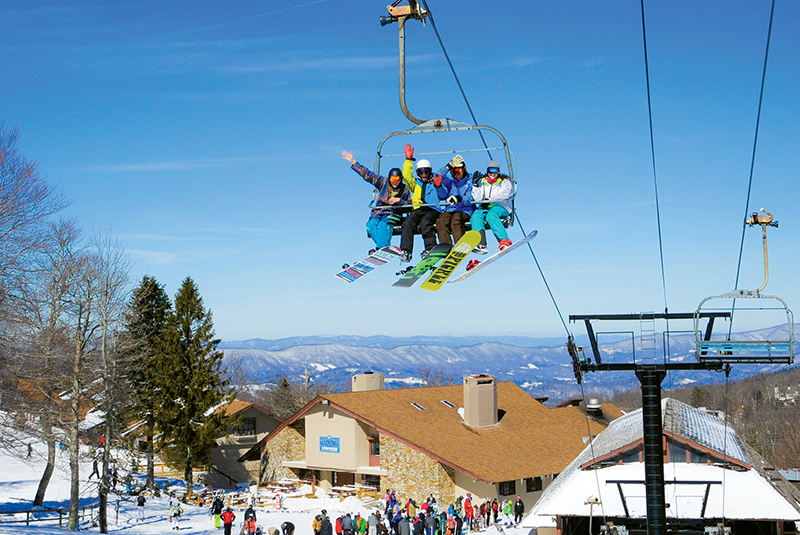 Among its many distinctions, Beech Mountain offers the highest-altitude skiing in the eastern United States. Opening a ski resort in North Carolina was a gamble in the 1960s: Would southerners embrace this chilly sport and opt out of heading north to take to the slopes? It was a risk that Thomas Brigham, a dentist from Birmingham, Alabama, was willing to take when he founded Beech Mountain Resort in 1968. The High Country getaway celebrates 50 years of hosting skiers this year, and Gil Adams remembers nearly every day of it. He learned to ski on the mountain and later became director of the ski patrol. “This place was magical back then,” he remembers. Today, Adams serves as Beech’s mountain manager. The combination of topography and snowmaking machines makes skiing possible in Western North Carolina. At Beech Mountain, the altitude in particular gives things a lift: With a peak elevation of 5,506 feet, it’s the highest US ski area east of the Rockies. Both novice and experienced skiers flocked to the resort during its early decades, and though the allure of southern skiing faded somewhat in the early 1990s, Adams says the slopes are once again packed with skiers. In addition to skiing, the resort offers tubing, ice skating, and a Swiss Bavarian Village, which includes a newly renovated ski center, ski shop, and bar and grill with live music. It also recently opened Beech Mountain Brewing Company, which crafts its own beers and is open to all visitors, even if they don’t participate in resort activities. And the 5506' Sky Bar is the highest-altitude watering hole in the eastern US. Where to ski in NC?